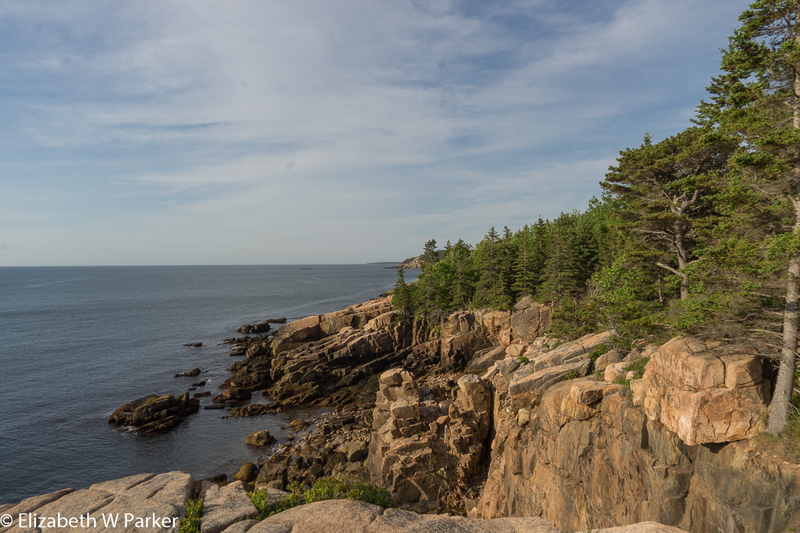 Part III: In which we return to the travelog version of my Maine scouting trip., and I go to Acadia National Park. Yes, it is a scouting trip. I am not here long enough for anything except to decide if I want to return. So far, the answer is yes…My time in the Portland area was great, but there is still more to see there, people and places; the Maine Media Workshop experience still has more to offer; and the little I have seen of Bar Harbor and Acadia has merely whet my appetite for another round in another season. 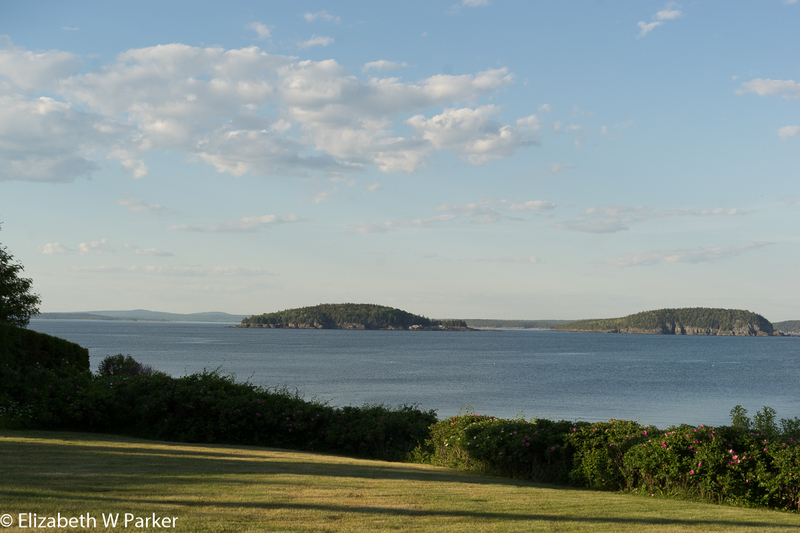 So let me tell you about the Bar Harbor and Acadia portion so far. So anyway, it was just past 5. The previous night I had not slept well and I had been going all day, so I was pretty worn out by the time I got to my hotel, the Primrose Inn on Mt. Desert St. I took the opportunity to take a rest. I also made a reservation for dinner (via Open Table, a really useful app!) at a place called the Reading Room. 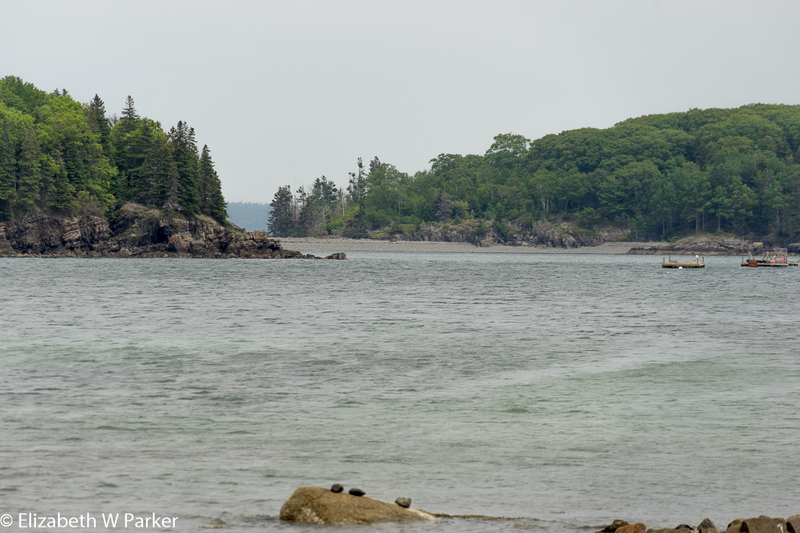 I looked it up on the map, and once oriented to Bar Harbor I struck out for a little adventure. I wanted to walk on the Shore Path, that being an historical and supremely touristy thing to do. 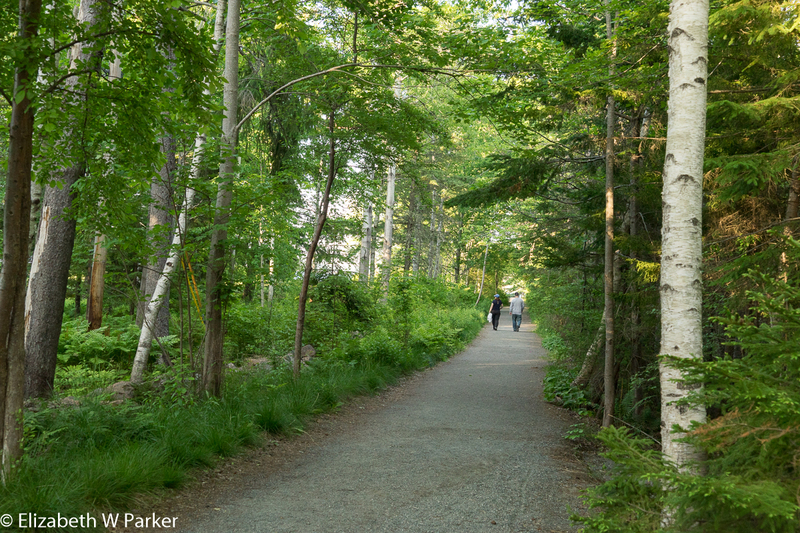 I did have a slight problem finding the actual path… I wanted to start at the very opposite end from the main bustle of Bar Harbor, but the street that was marked “Shore Path,” though it looked straight on the map, didn’t actually get me there. This was off of Lincolnshire St. I had to head slightly back the way I came before I found the access to the path without invading private property. Based on the picture I had seen in my guidebook, I expected the path to be paved, but it was loose gravel, well maintained for the most part. It was about 6:30 so the sun was pretty low in the sky and it was low tide. There were some other people walking the path, but fewer than 20 did I encounter along the way. It was very pleasant and easy to stop to look or take pictures. Most of the people I saw were couples – of all ages and configurations – it is a romantic thing to do of an evening, to be sure. 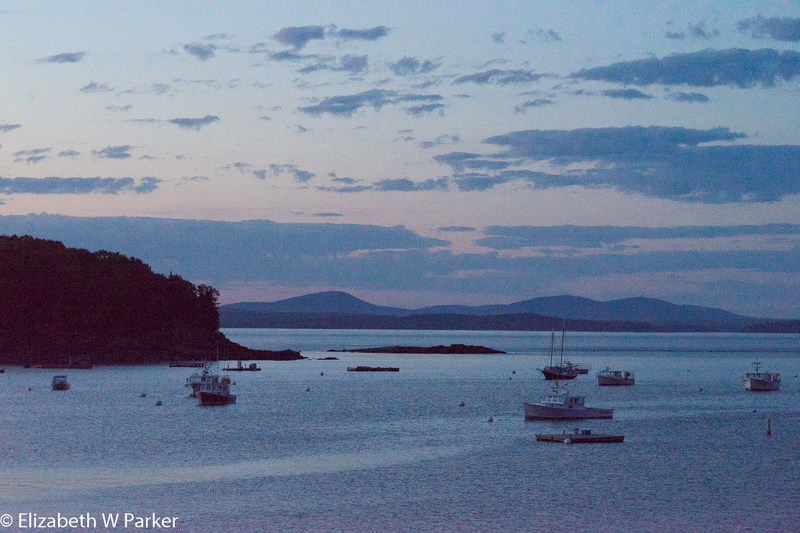 As I neared Bar Harbor, I started to see more people, more families with little children. School is just out for the summer as of this weekend, so there aren’t many families with school age children YET! I hear they are just a week or so away from the summer inundation. I am here at a really good time. 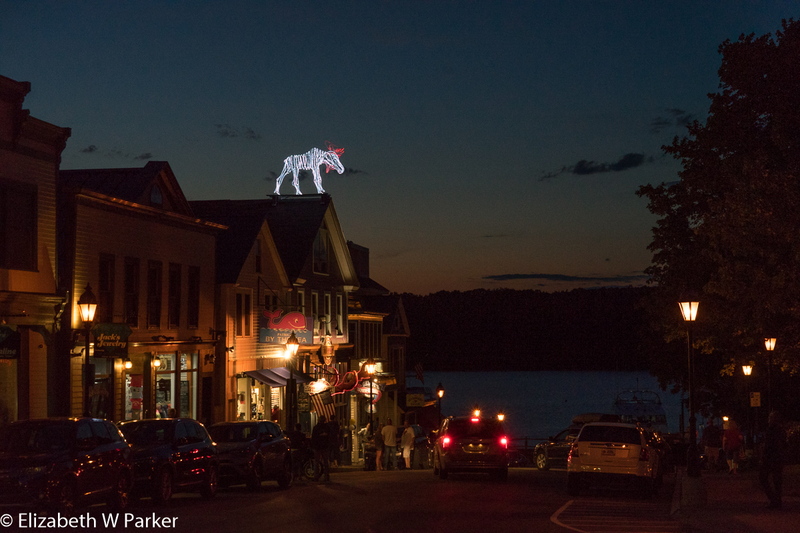 My walk ended near Algoma Park in the thick of bustling Bar Harbor on a Saturday evening. It took me a bit of searching, walking with my map app open, to find my restaurant The Reading Room. 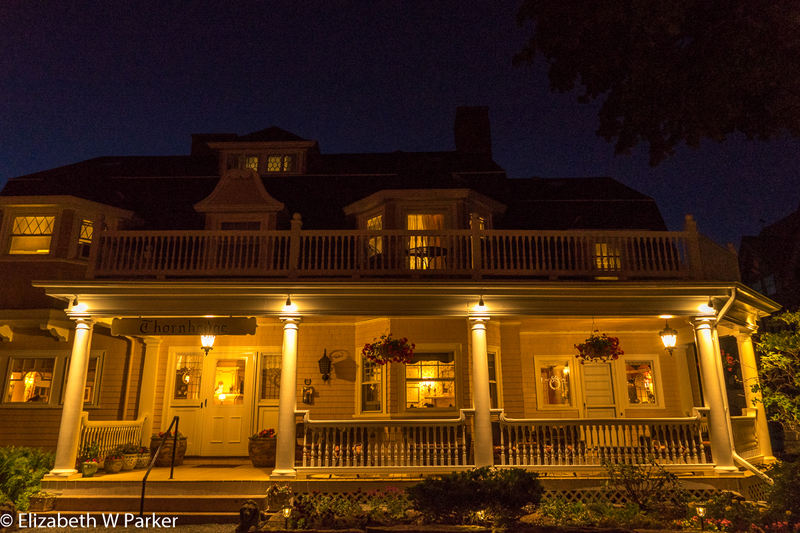 It was inside the Bar Harbor Inn! Nowhere on Open Table did it tell me that. I was looking for a free-standing building or at least a dedicated entrance. I actually had to go in the Inn and ask. The venue was very nice, and so were the staff who greeted and seated me. I had a little table right next to the window with a view out onto Frenchman Bay. Below me was the outdoor terrace restaurant, so people watching was front and center. There is a humorous story about the origins of The Reading Room. It was built during Prohibition as a cultural gathering place. A sign nearby (Part of the History in the Streets series you see all over Bar Harbor) says the only reading the wealthy patrons of the Reading Room did was through the bottoms of their whiskey glasses! My dinner was elegant and leisurely. I needed to slow down after my frenetic week at Maine Media and I needed (desperately) to savor my food. Conversation wasn’t lacking; I talked to myself. (Not out loud, of course!) I was quite thrilled with my dinner companion – we both liked the food – though she kept reminding me that vegans don’t eat lobster and I kept reminding her that I am on vacation! We remained amicable. Life is short. The sun went down during dinner. I was setting on the opposite side of the dining room and I could see the colors that streaked the sky as it went lower and lower, but I was not sorry I wasn’t on that side of the room. The people there had the sun right in their eyes. The view for sunset pictures was also not that good – there were buildings in the way. Even when, later, I tried to make them so dark they were indistinguishable there was no way to disguise that the blocky shapes were man-made structures. I wandered through the village (here, they probably call it a downtown) and peered into the shops that were still open, took a couple of photos, even bought a art glass necklace and earrings in a high-quality crafts store. My wandering took me back to my hotel and an early retirement. Sunday morning, I woke up early and finally got up and out of the hotel by 5:00 am. I wasn’t aiming for the sunrise shift on Cadillac Mountain (I’ll save that for fall or winter when the sun rises at a decent hour). My hotel offers the CD and transcript of the Park Loop road tour. I had set out this morning with it in the player and enjoyed listening to the material, though not much of it is earth-shatteringly interesting. 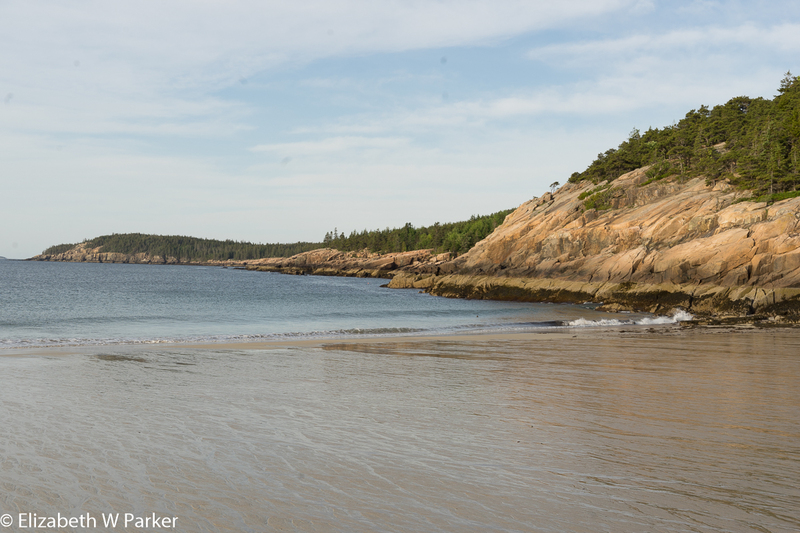 The next stop was Sand Beach,an unusual beach for Acadia. 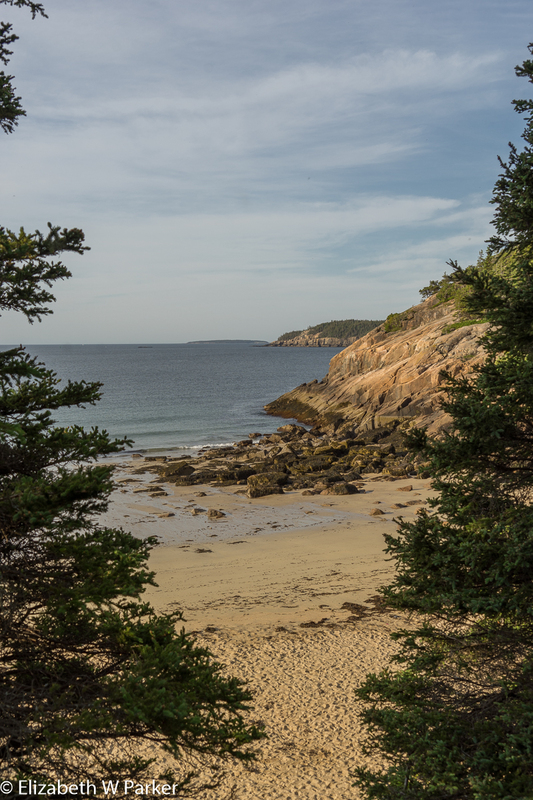 Most of the other beaches here, in little coves, are stone beaches, due to the granite bedrock. The waves break the rocks and tumble them around for eons and they end up on these cove beaches. The Sand Beach is made of sand from shells. There is a rock formation in the inlet that goes into the cove were the San Beach is. It slows down the wave action, allowing shellfish to populate the rocks. As their shells break up they are washed onto the sand beach where waves and tides continue to break them down into sand like particles. The sand is not deep, though. It sits on granite bedrock and storms from the ocean can change it in a flash. I saw and heard the Thunder Hole, though on an ebbing tide it sounded more like a giant groan. The outermost vantage point was closed due to dangerous conditions. According to my CD tour, the best time to go is 1 1/2 hours before high tide. As I drove along the road, I could see the stunning Otter Cliff ahead of me. 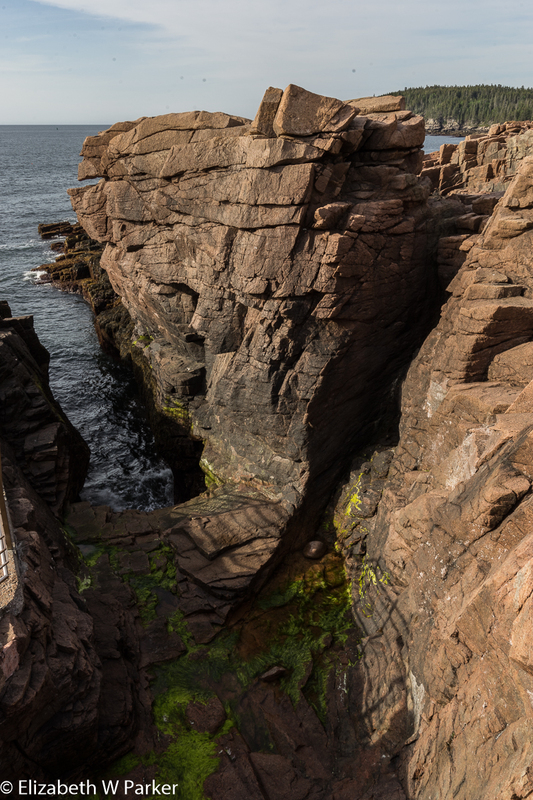 These are the highest seaside cliffs on the Atlantic coast. I also stopped at Otter Point and lastly at the Fabbri Monument before I rejoined Rte. 3 and returned to Bar Harbor for breakfast. I had a couple of things I had to do on the computer after breakfast, so it wasn’t until about noon that I headed out again to the park. This time, I drove back to the Hull’s Cove Visitors Center to get a cancelled stamp for my National Park Passport. (That’s for my inner child!) The Visitors Center was a zoo (not literally)! I also got a holder for my National Park Pass as I was warned that in Acadia the rangers can be sticklers for having your pass displayed so they can see it. I don’t remember when I lost my holder, so I wanted a new one anyway. With all that accomplished, I set out to see the part of the CD itinerary that I had missed in the morning. That was easier said than done. There was so much more traffic in the park in the afternoon that I often found it too hard to turn off the road to see something, and when I did turn into a parking lot, it was chock full. This section of the Park Loop Road is two way, so no parking along the side. I finally found a place to park, so decided to walk on the one of the carriage roads. I was ready for a walk instead of just jumping from the car to take a photo and then driving on. You can read all about the carriage roads in many other places, so here I will just mention that they were planned and built by John D. Rockefeller, Jr. 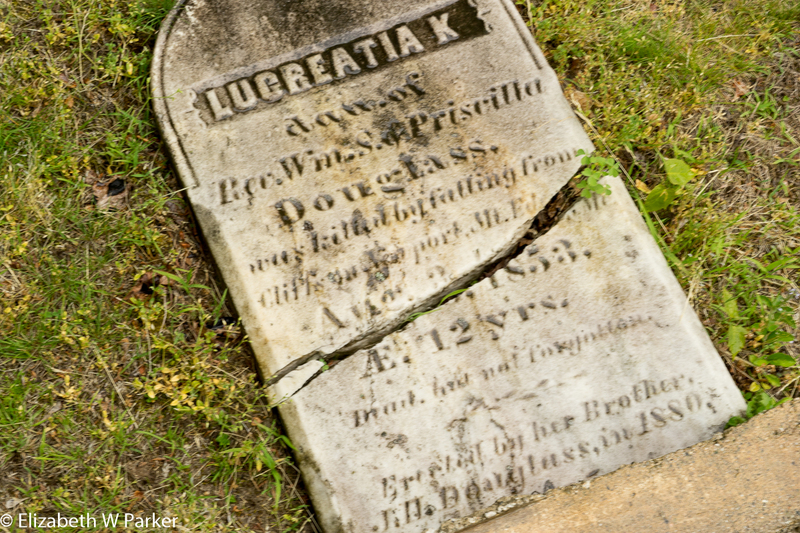 They are crushed stone roads – no vehicular traffic except horse-drawn carriages, even today. Walkers and runners are heavy users, bicycles are allowed on some of them. They link interesting sights along the way, but as a walker the trip can be quite long as most are not loops. As far as you go, you have to also walk back to get to your car, unless you were smart and took the park bus! The walk was relaxing and pretty. I passed streams with beaver lodges, meadows, little lakes or ponds (more beaver lodges), lots of white-barked birches and tall pines. I could have been in Wisconsin. I actually felt very proud to think that Wisconsin is this beautiful, too. 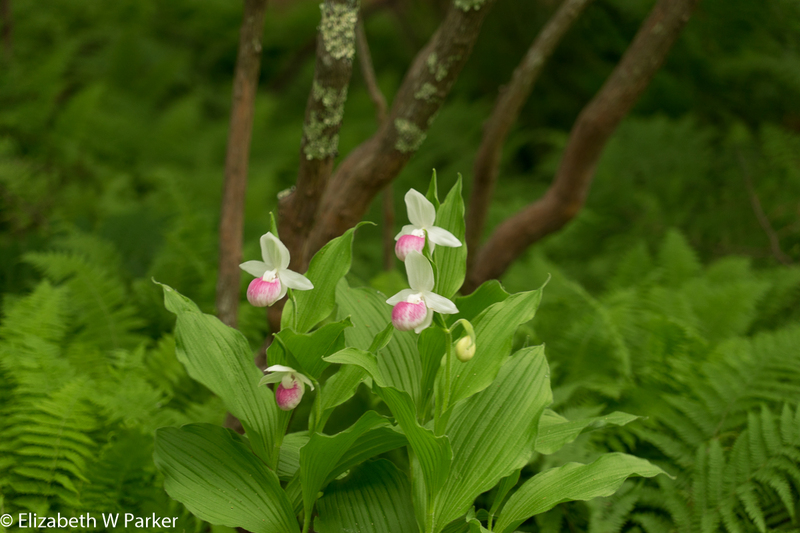 No National Parks to draw visitors, but Wisconsin is famous in its own part of the country for the beauty of the Northwoods. Mouli-Bouli or some such thing – made of musssel shells! I made a little detour into Northeast Harbor. Some shops were open, most were not. It had a very unspoiled-by-modernity feel to it! I came back to my hotel about 5 o’clock and managed to get a reservation through Open Table for a restaurant called Havana. Though the food was good and the service excellent, my experience there was ruined by the table where I was seated. When I was seated (pointedly the manager had told the hostess I was at “Table 10”) there were fewer than a handful of people in the restaurant. They were all seated in the front 2/3rds of the place and I was seated alone in the back 1/3. The areas were separated by a corridor with waist-high walls on both sides. This was the path that the hostess used to bring people to their tables. From the very first, I did not like the table I was given – if I sat on one side of it I had to look into the kitchen, and sitting, as I did , on the other side I had people walking behind me all throughout dinner as the hostess brought them down that corridor and walked them behind me to take them to the outdoor patio. If the place had been full, okay. But it wasn’t. I wasn’t pleased. It is windy! My window is open for the fresh air. I am dead tired. I think all the fresh air has something to do with it. Last night I fell asleep before 9. I didn’t finally wake up and get up until 8. It was rainy this morning so there was no hurry to get out. 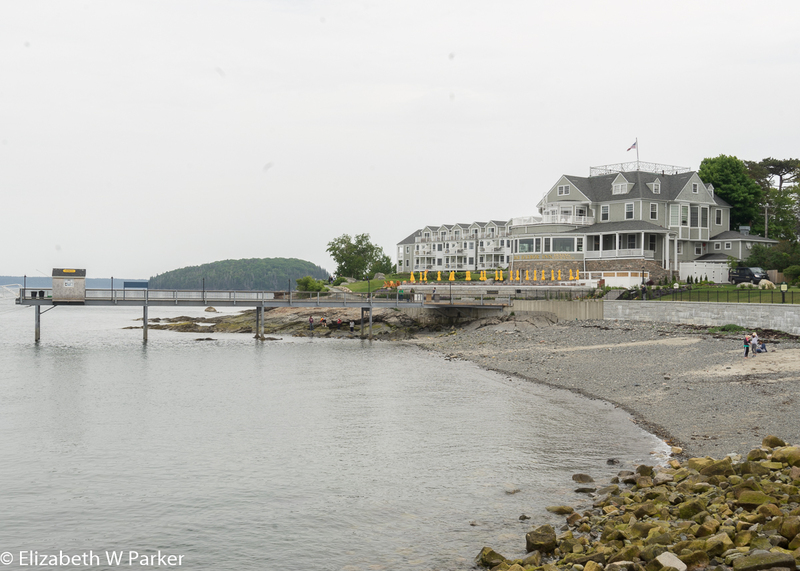 When I did, I took advantage of the bad weather and spent some time seeing the sites in Bar Harbor. Naturally there is lots of shopping, some good, some terribly kitschy, but I opted for Tiffany. No, no Tiffany store in Bar Harbor, but there are Tiffany stained glass windows in the St. Savior Episcopal Church just steps from my B&B. The windows were beautiful. So were the other windows (the Tiffany windows are just 10 of 37 total). I also loved the most modern windows as well as some of the historic windows by artists whose names I did not recognize. 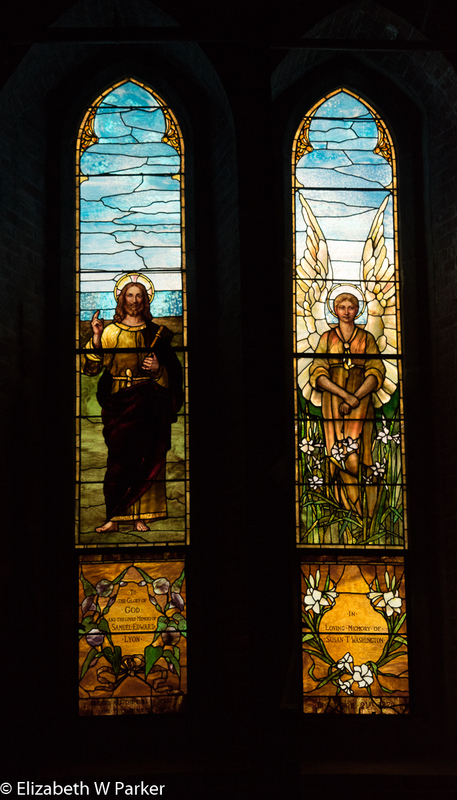 How ironic it was to be reading about the internment of immigrant children in the news over breakfast and then go to see a multitude of high quality stained glass windows, the majority dedicated to the memory or minors who had perished untimely. Whether you chalk that up to privilege or not, I doubt you would argue that care and safety of children is an American value. Or was until 2018. The church had a wonderful vibe, notwithstanding all the child-centered windows, or perhaps because of them. After all, we are talking, for the most part, about deaths of over a century ago. I have always felt this kinship with the ancestors when in church. Places where many people have been before me create a strong sense of kinship. 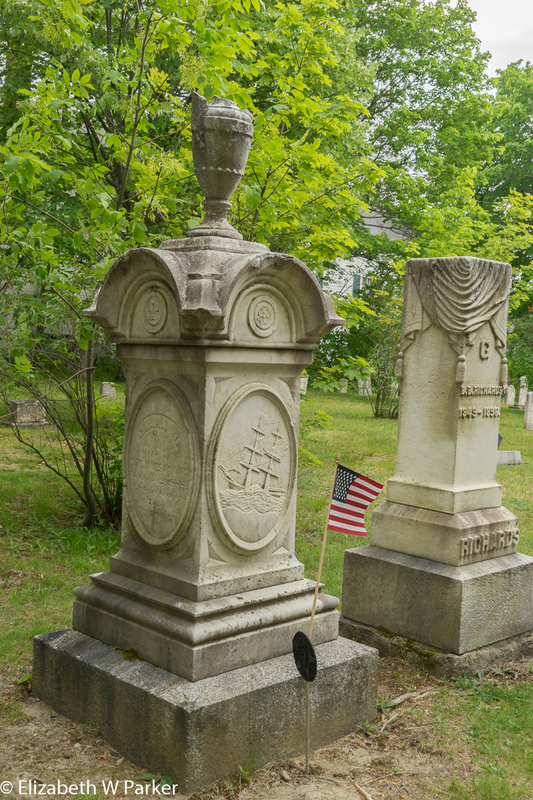 Note the ship – and the flag that denotes the grave of a soldier. Which war? I met a man (the priest?) 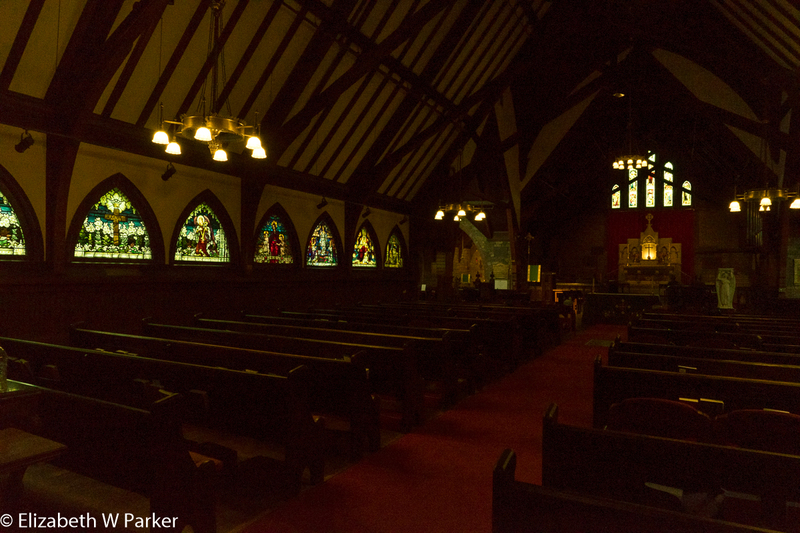 with a great working knowledge of the history of Bar Harbor and the church. He had many interesting stories about both. Lots of fun to talk with on a rainy morning. The church is open for the viewing of the windows every day from 8:00am until 5:00pm (but check these hours because I saw them listed differently in different sources). There is a guided tour, but I just used a brochure with a list of the windows made for those who visit at other times. Just walk in, the place may be empty, but it will be open. I gladly made the suggested $5 donation. After the visit to the church, I ventured into the burying ground immediately adjacent. There were many very old headstones, again lots for small children, all mostly a century ago or older. Fitting the somber mood, it started to rain so I quickly crossed the street to the Abbe Museum. 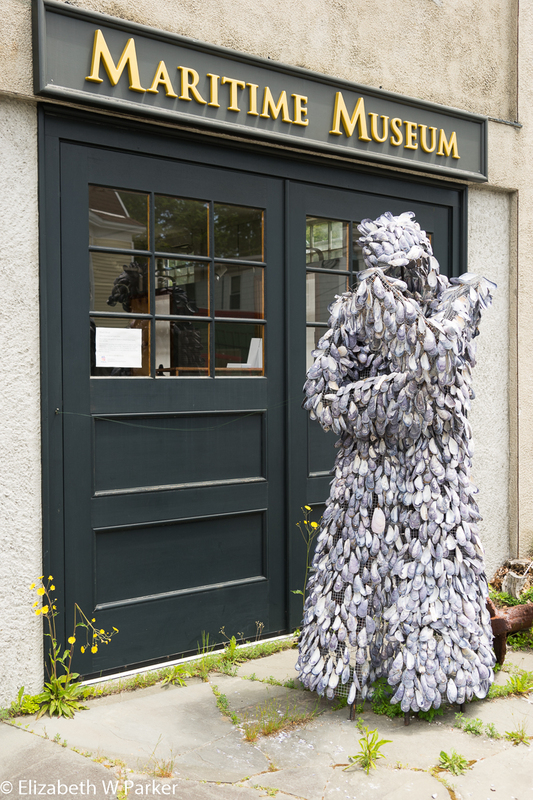 The Abbe Museum is dedicated to the history and culture of the first people of Maine – a group of tribes know as the Wabanaki. 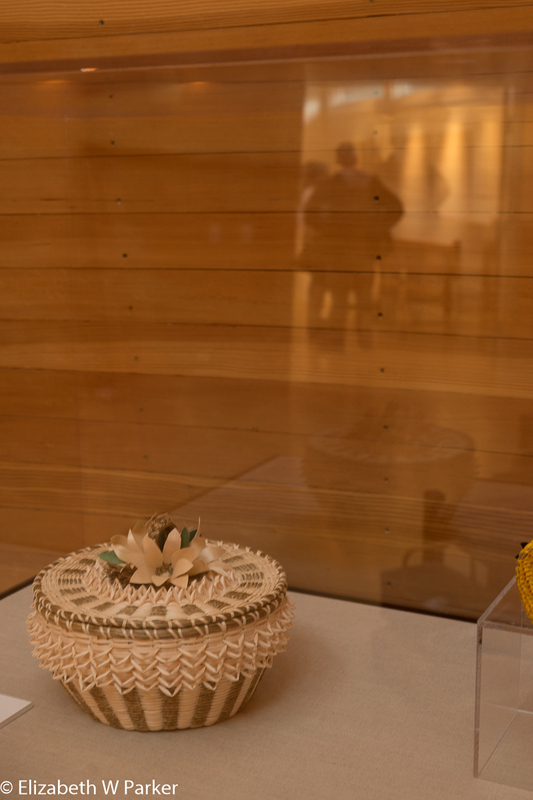 Interestingly, the museum focuses on the way the Wabanaki present themselves and their culture – a subtle, perhaps, but interesting distinction. There is great respect evident in all the exhibits. The breadth of the exhibits is also noteworthy. On the recommendation of a young docent I met in the orientation room, I paid special attention to an exhibit of root clubs. 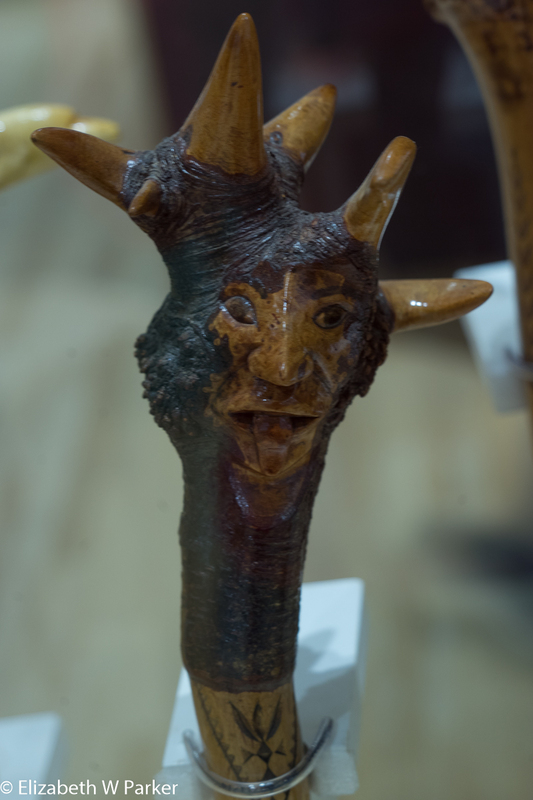 First used as weapons, the clubs today have a much more pacific use – in ceremonies and as gifts. There seems to be a lively tourist market for these, too. The exhibit includes lots of examples, a video showing how to make them, one you can wield yourself, and lots of history and trivia. 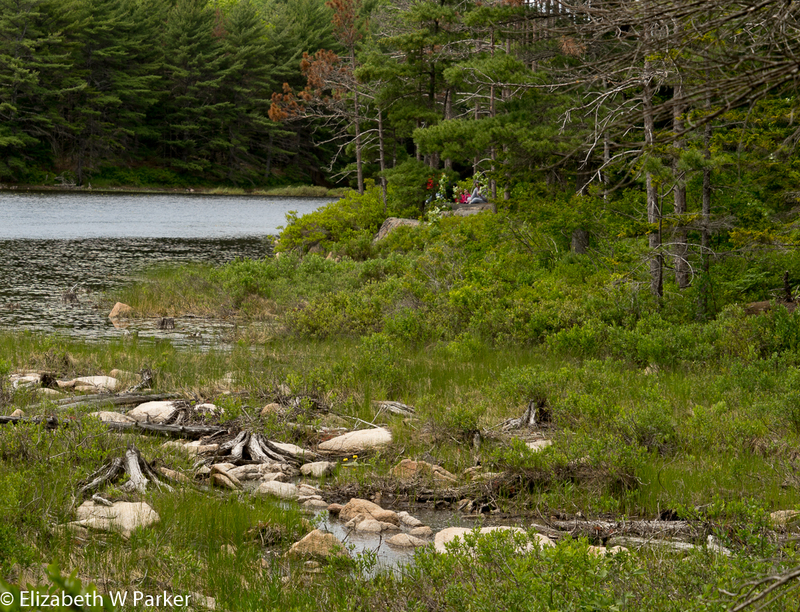 The Wabanaki are actually 5 different peoples with intertwined histories. This is a good place to get a look at the way Native peoples have been treated by the US government over the centuries since white men came to these shores. The history of these specific peoples was repeated all over the country. Sadly, still today there are state governments expropriating their land for mining and other commercial interests of non-natives. 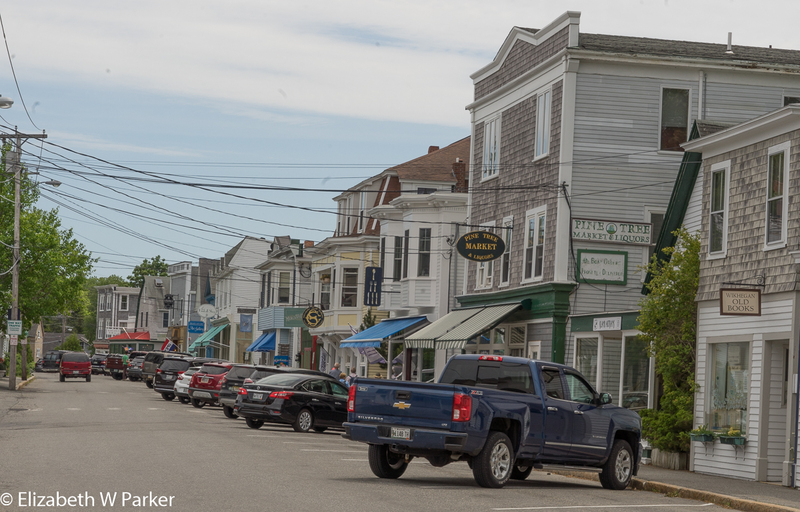 This is what the houses of Bar Harbor may have looked like in its heyday. I walked a way on the Shore Path to get back to Mount Desert street. The tide was different, but the sky was still leaden and uninteresting. I had lunch at a place called Project Social. I managed to find something light and mostly vegan – a novelty for Maine so far. 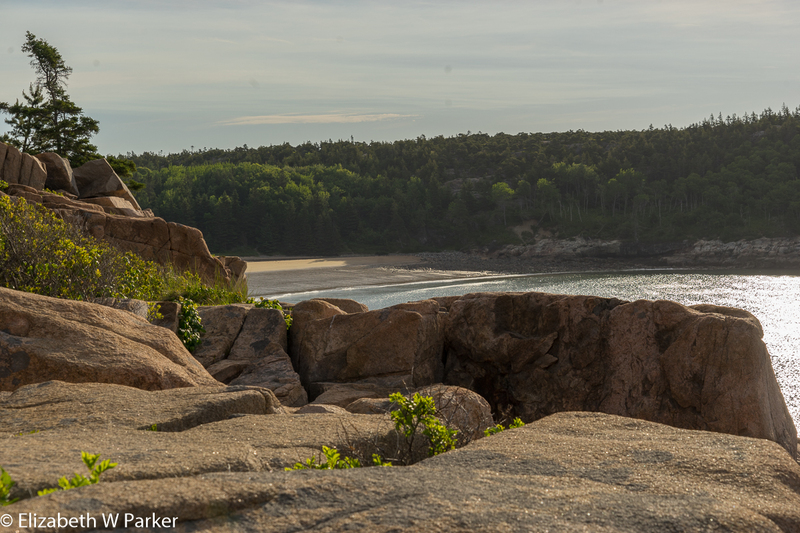 I had been hoping for good weather in the afternoon for a return trip to the parts of Acadia I saw my first morning. I wanted to see them again at a different part of the day and under different tidal conditions. I was disappointed by the weather. It remained gloomy and even started to rain! I went anyway – even rain can be a good picture opportunity. Then, back in the car, I concentrated on the ocean parts of the tour. 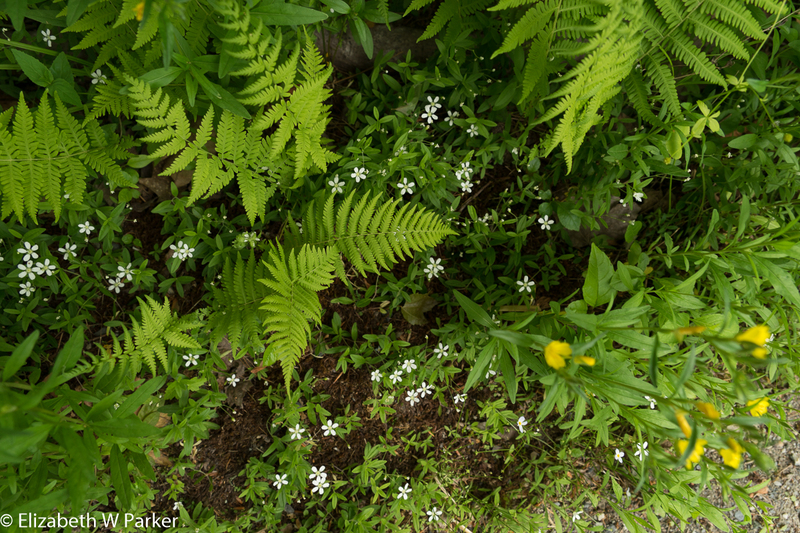 The previous afternoon I had been in the woods and walking on the carriage roads, but that felt so like WI that I made a vow to concentrate on what we do not have in Wisconsin – oceanscapes! From a human being’s point of view, the oceanscapes are not that different from the great lakes’ scapes…in both cases you can’t see the opposite shore. Today, the wind was whipping up action on the ocean so there were more waves and mores noise. The final place I wanted to see on this trip was the summit of Cadillac Mountain. Wow! Was it windy up there. I could hardly stand still, the wind was strong enough to almost knock me off my feet – no exaggeration. I noticed that the guidebooks says it is windy, but I wonder if it is always that windy. 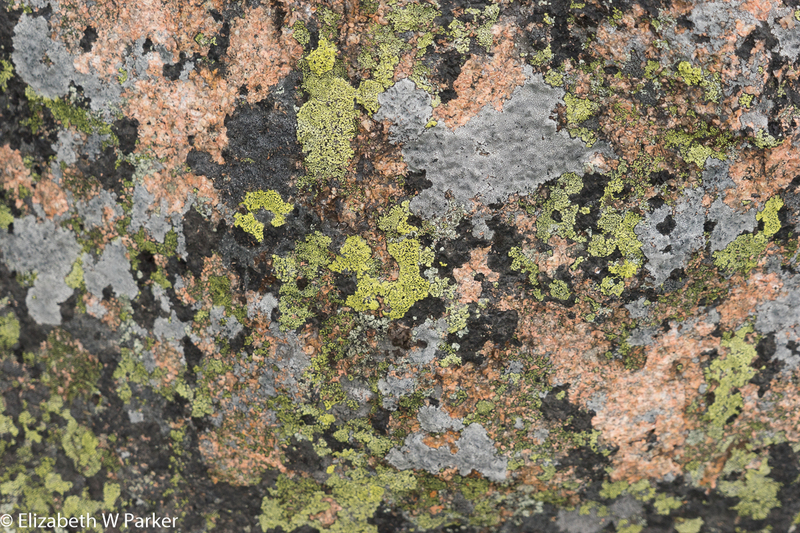 The rainy weather, fog moving in too, didn’t do much for the views, which are purported to be spectacular, but the summit is very colorful, especially on a wet day when all the colors are saturated: greens, black, pink, grey – very lovely. Back in Bar Harbor I went to Poor Boys for dinner. It’s an Italian place. I had great linguini with capers, tomatoes, mushrooms and grilled scallops. The staff was very good. Getting back to Wisconsin was an odyssey. I left Bar Harbor at 8:30am expecting a 3:15 hour drive to the Portland Jetport (Name reminds me of the Jetsons!) I arrived at 11! No problem, just more time to kill. But American Airlines didn’t think we had enough time to kill, so they delayed the flight. I stayed calm – after all Chicago is my final destination and my car is there to get me home. We got on the plane – and Chicago was closed for weather. We deplaned. Chicago reopened. We re-planed. Chicago was closed again. The flight was cancelled. Great! All in all, the trip was great! I will do any and all parts of it again!